And there was a tremendous responses. Most people suggested Johnny Depp (3 votes), Matthew McConaughey (4 votes), and Jude Law (3 votes). Anomie-Atlanta gets all the credit for starting the Matthew McConaughey train of thought. To be honest, when I saw the McConaughey vote, I thought...well he looks like him I suppose but I don't think he can pull off such a challenging part. Part of why I think McConaughey would not be up to the role is because of what Jordon M. Poss said in his comment. "You have to find someone with enough screen presence to make what could be a small role very real and very memorable, since the actor would essentially be acting in Liam Neeson's shadow." I imagine that's why there are so many suggestions for Jude Law. I think of Jude Law's role in The Road to Perdition, it was very similar to what Steven Spielberg might be looking for in the characterization of John Wilkes Booth. Other mentions were Kevin Kline, and Adrian Brody both came in with two votes. Also Freddie Prinze Jr., Harry Connick Jr., Jeremy Davies, Gary Sinise, and Hugh Jackman each were suggested as well. I'm really surprised that no one mentioned John Malkovich. I can hardly get the idea of Malkovich out of my head since in In the Line of Fire his assassin character tells Clint Eastwood to call him "Booth." But just as Tom asked if Kevin Kline is too old, I ask myself if Malkovich is too old. Booth killed Abraham Lincoln with Booth was 37 years old. John Malkovich is 52 years old and Kevin Kline is 58 years old. 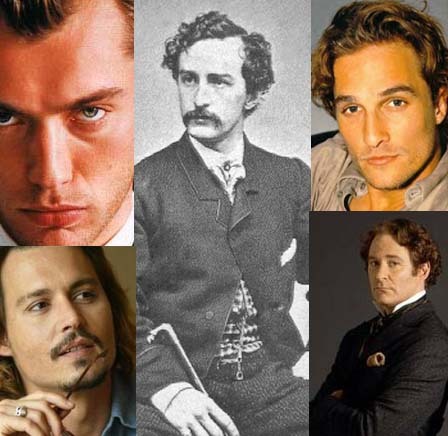 Interestingly enough McConaughey is 37 years old, just like Booth at the time of the assassination. One person even jokingly suggested Liam Neeson play Booth, even though Neeson's playing Lincoln. Whaddaya mean it doesn't count. With a mustache I look just like the guy, only different. Kevin Kline would probably do a good job, but I just laugh at the sight of him. I think of him as a comedic actor. It would be like asking Steve Martin to play the role. Either could do the part, but the whole time, I'd be thinking of The Pink Panther, or A Fish Called Wanda, or The Jerk. Johnny Depp has proven that he can pull off just about any role. Jude Law has done the same. They are both really good actors. It will be interesting to see who plays the part. Light some sparklers and have a great day!!! Interesting to see who eventually wins out but I'm of the mind that Malkovich can do no wrong and I think he'd be great as Booth. Great site you've got here! Thanks for stopping by mine too! Every time I question Matthew McConaughey as an actor, all I have to do is go and watch back his closing arguments in the courtroom in A Time to Kill. Then I remember he can actually act. I'd have to say Kline would be the best option... he, like Matthew Broderick, could play someone much younger than he is in my book... I also like the Adrien Brody thought. Malkovich? Seriously? I mean, come on. You might as well get Walken. Law would be perfect. Let us also consider Tony Goldwyn. I can only image what this movie will do to peoples perception of History. Booth was an interesting person, and a huge part of history, I bet Spielberg will find some way of messing it up. Out of the names you listed I like Matthew McConaughey, he can pull off the character. Jude Law would be fine, but he'd have to swallow his accent. O.K. I think when considering actors who can take this film seriously I'll give my two cents because honestly I don't think McConaughey or Depp could do this. I have two suggestions for this film, one is Sam Rockwell a man who could not only fit the description perfectly but has the experience of plaing men with criminal minds, another suggestion (and Everyone will think I am crazy for this) is Tommy Lee Jones, I think a Neeson-Jones film by Spielberg will get the academy to notice these men. Just for fun if anybody gives me a chracter that I know of I will try to decide the person to play the part. Okay Kubrick...who should play Lincoln's wife? Hard One. Although, I think Dianne Wiest could be a great Mary Todd. DUDE, all I gotta say in McConaughey's defense is: Reign of Fire. Don't diss the movie or the man until you've seen THAT performance. Simply incredible. I also have this personal thing against Law, so no offense to the guy, but I just can't pick him. I like either Liam playing both characters, or McConaughey as Booth.